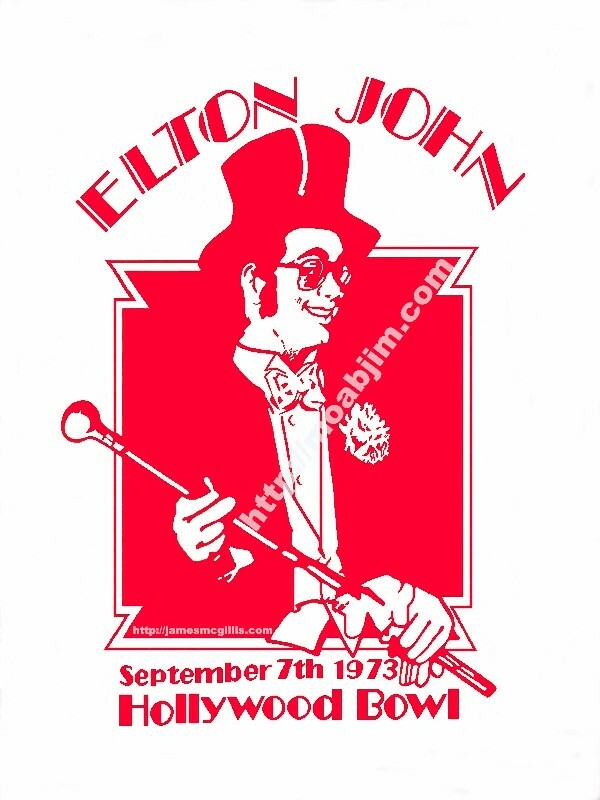 In late 2002, I dragged out my slowly deteriorating Elton John September 7, 1973 Hollywood Bowl vintage concert t-shirt and assessed its sad condition. The silkscreen image on my vintage Elton John t-shirt was crumbling further with each washing. A spirit told me that I might have the last souvenir t-shirt from that magical Hollywood night, so I decided to restore my vintage 9/7/73 garment. After snapping a digital picture of the t-shirt, I began the laborious "re-pixilation" of that image. Over the course of several months, I spent at least 200 hours restoring my 9/7/73 Elton John T-shirt image to as close to the original merchandise as possible. Click Here to read more about Elton John's September 7, 1973 Lost Concert at The Hollywood Bowl. 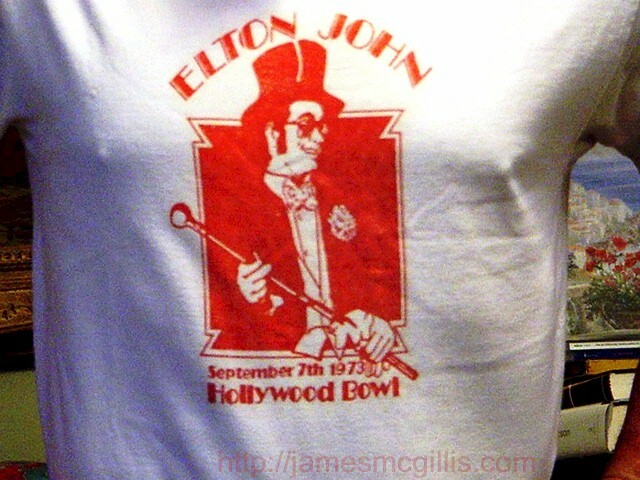 The Elton John replica concert t-shirt is a MoabJim worldwide exclusive item, not found on TV or in any store. 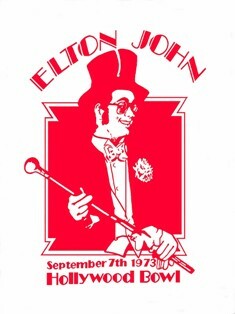 Be the first on your block to relive Elton's classic live concert of 1973 in bright red style. To learn more or to make a secure purchase via PayPal, go to MoabJim.com and click on the word "Apparel". Ten dollars of every purchase will go to the Elton John Aids Foundation. Elton John - The Lost Concert, Found - Thank you Judy for finding Elton, singing Crocodile Rock, live at The Bowl. For a rare treat, please click on her link, below. January 5, 2014 - Author's Note - After shipping another Elton John replica t-shirt to a customer, I received the following note from fellow concert attendee, "N.K.". His vivid recollections of that night and the concert itself help us all to remember that special night with Elton John at the Hollywood Bowl. I received the t-shirt and washed it per your instructions, but haven't worn it yet. Elton's 9/7/73 Hollywood Bowl concert has become one of my favorite stories, one that I tell over and over again. Just walking in with everyone to find our seats was an experience, as I'm sure you remember that the crowd was really into it as a "happening" and LA did it up right. Everyone was dressed and ready for a party, and Elton sure gave us one. One thing I remember was seeing someone wearing clear plastic platform shoes with live goldfish in them, and everyone was dressed to the nines. Remember the mermaids? The stagehands carried out a couple of women in full mermaid costumes and set them down in the fountains, which started flowing and lit up with colored lights. All the "celebrity" guests walked up the stairway and then down to the audience, and when they lifted up the lids of the five pastel-colored grand pianos that spelled out "E-L-T-O-N" on the lids, all the doves flew out of the pianos, and circled round and round in the colored spotlights pointing up above the audience. The smoke from all the joints going in the crowd was like fog in the air, and when Elton walked down the stairs in his furs and plumes, and his glasses lit up to spell "Elton", the crowd went crazy. As I recall, he did a set with the band, then a solo set at the piano, and then brought the band back for the finale, and each song was one that everyone knew. I think it was part of the Yellow Brick Road release tour, and as Elton himself said, he was at the peak of his creativity. Thanks for the effort you put in to recreate the T-shirt - I'm looking forward to wearing it for the first time and saying "This shirt? Let me tell you what that concert was like..."